The Left Green party has been the fastest rising star in the polls for the last few weeks, going from having little following to being the third biggest party after the Pirates and the Independence party. They created a series of ads in the final days of the race that have stirred some controversy, particularly on social media. 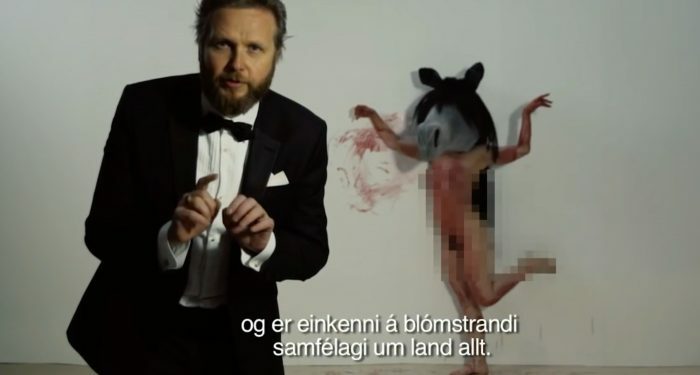 Artist Ragnar Kjartansson joined the election effort and played a leading role in the ads. The ads have messages that mostly revolve around the value of arts, education and culture, the importance of healing the land and environmental issues but the means to convey the message is an unusual one. In one ad Kjartansson mixes a drink with Katrin Jakobsdottir while they ponder the components of a healthy society, using the cocktail mixing as a metaphor. In another one a naked women with a horse’s head is seen performing in the background and Kjartansson comes to the foreground and whispers to the viewer about the significance for each society to have a strong and healthy creative scene and in another one Kjartansson is driving in his car giving monologue about how the Left Green party also likes to grill at night and gain in the daytime, making a wordplay about a famous sentence from a member of the Independence party in the years leading up to the financial crash in 2008 how they like to “Grilla á kvöldin og græða á daginn” wich means to make a barbecue at night but make money in the day time. The word “græða” also means to heal in Icelandic so Kjartansson explains that the Left Green people also like to “Grilla á kvöldin og græða á daginn” They barbecue BULSUR at night, a local production of vegan hotdogs, and in the day they heal the land. Kjartansson is seen planting a trea in a windy barren landscape. A few of the videos are included below.